Carwood Lane, Whittle-le-Woods, Chorley, Lancs, UK. Carwood Lane, Whittle-le-Woods, near Chorley, Lancs. UK. The above view shows the first 14m of completed wall. It may not look all that pretty but it should stay up for a while, and it was all our own work. For the technically minded the picture is composed of 7 separate images stitched together on the PC, bet you can't find the joins! 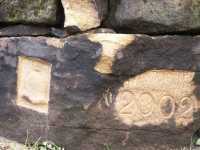 Carwood Lane, Whittle-le-Woods, Chorley, Lancs. UK. 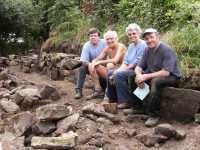 Carwood Lane is now a footpath enclosed by ancient stone walls. In the years before the coming of the canal in the late 1790's and early 1800's this route was the main thoroughfare to Blackburn. 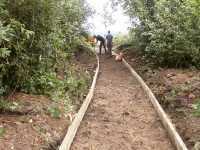 A scheme has just been completed to re-build the collapsing wall and provide a new footpath which was quite wet and muddy in places. Sun 03 Nov 2002 The final length of wall is completed. Unfortunately I was away on holiday at the time so missed all the fun. Sun 13 Oct 2002 [Day 8] A good turn out and a very good day's progress. In spite of a wet day yesterday the weather turned out good, if a little chilly later. We have now re-built 86m of wall. Sat 05 Oct 2002 [Day 7] Not as many people on site today but a good day's performance by all. 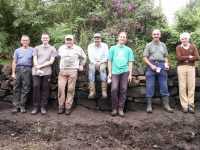 Except me as my bit of wall was a bit lower than the rest at the end of the day. The annoying thing about dismantling the old wall is that the last bit down to the foundations takes as long as the rest of the wall. Or is it just me? Sun 15 Sep 2002 [Day 6] Another good day's progress. 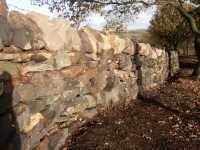 I can't claim any credit for today's wall-building as I was away on a sponsored walk. Sun 8 Sep 2002 [Day 5] The foundations of the next length have been excavated and we are now setting the foundations in place. 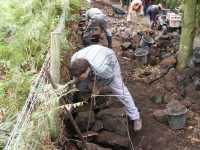 By the end of the day a grand total of 43m of wall have been completed and a further 15m are part complete. Sat 31 Aug 2002 A study in concentration. Wall-building continues with the completion and capping of the wall started at the last session. 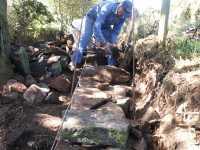 A further length of wall was dismantled, the foundations dug out and re-building commenced. Thu 29 Aug 2002 The Contractor setting out the edge boards for the footpath. 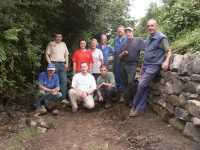 Sun 18 Aug 2002 With 14m of wall now re-built we began our 3rd session by digging out the foundations for a further 24m. The weather was kind to us most of the day. The forecast was for a sizzler, but it wasn't. Just as we were tidying up at the end it began to rain. 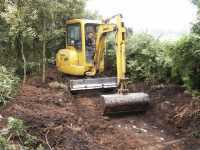 Of the 24m worked on most was dug out to foundation level and 70% built up to 0.5m high. Ken (our tutor) is on the extreme right leaning on the wall, or is he testing it by trying to push it over? 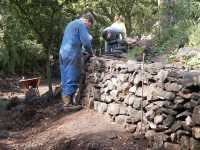 Sat 10 Aug 2002 The first length of re-built stone wall was completed today (14m). A rainy start made for muddy conditions but things dried up later. Thanks to the support crew of Barbara and Margaret who provided tea and chocolate fudge cake. It later turned out the 'fudge' cake was supposed to be a chocolate sponge but it went wrong and didn't rise!! 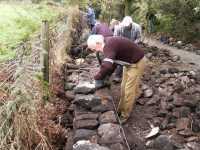 Sun 28 July 2002 A team of local volunteers began a dry stone wall training programme run by Ken Clayton, a master craftsman. 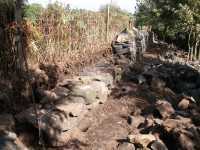 It was a hard and hot day but about 10m of massive foundation stones were set in place after a lot of digging out and clearing.